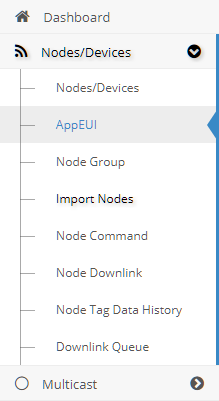 The Applications item is simple to find: it is placed under the Nodes menu, on the left side. An Application may be seen as a box where are placed the Nodes. Every Node MUST belong to ONE Application. One or more Nodes may have the same Application. A Remote Keys table - this table is used to set a unique identifier for the synchronization with some types of LoRa Server. This table is used to set Keys for the synchronization of certain types of LoRaWAN™ Server. See Connectors for more details.